I need to begin by letting everyone in on a little secret. The secret is that Kirby Bumpus, Stanford Class of ’08, is my goddaughter. So, I was thrilled when President Hennessy asked me to be your Commencement speaker, because this is the first time I’ve been allowed on campus since Kirby’s been here. You see, Kirby’s a very smart girl. She wants people to get to know her on her own terms, she says. Not in terms of who she knows. So, she never wants anyone who’s first meeting her to know that I know her and she knows me. So, when she first came to Stanford for new student orientation with her mom, I hear that they arrived and everybody was so welcoming, and somebody came up to Kirby and they said, “Ohmigod, that’s Gayle King!” Because a lot of people know Gayle King as my BFF [best friend forever]. I said, “Sort of? You sort of know me?” Well, I have photographic proof. I have pictures which I can e-mail to you all of Kirby riding horsey with me on all fours. So, I more than sort-of know Kirby Bumpus. And I’m so happy to be here, just happy that I finally, after four years, get to see her room. There’s really nowhere else I’d rather be, because I’m so proud of Kirby, who graduates today with two degrees, one in human bio and the other in psychology. Love you, Kirby Cakes! That’s how well I know her. I can call her Cakes. I just love saying “Stanford.” Because the truth is, I know I would have never gotten my degree at all, ’cause I didn’t go to Stanford. I went to Tennessee State University. But I never would have gotten my diploma at all, because I was supposed to graduate back in 1975, but I was short one credit. And I figured, I’m just going to forget it, ’cause, you know, I’m not going to march with my class. Because by that point, I was already on television. I’d been in television since I was 19 and a sophomore. Granted, I was the only television anchor person that had an 11 o’clock curfew doing the 10 o’clock news. So, in 1987, Tennessee State University invited me back to speak at their commencement. By then, I had my own show, was nationally syndicated. I’d made a movie, had been nominated for an Oscar and founded my company, Harpo. But I told them, I cannot come and give a speech unless I can earn one more credit, because my dad’s still saying I’m not going to get anywhere without that degree. But I also know why my dad was insisting on that diploma, because, as B. B. King put it, “The beautiful thing about learning is that nobody can take that away from you.” And learning is really in the broadest sense what I want to talk about today, because your education, of course, isn’t ending here. In many ways, it’s only just begun. So, today, I just want to share a few lessons—meaning three—that I’ve learned in my journey so far. And aren’t you glad? Don’t you hate it when somebody says, “I’m going to share a few,” and it’s 10 lessons later? And, you’re like, “Listen, this is my graduation. This is not about you.” So, it’s only going to be three. A year after I left college, I was given the opportunity to co-anchor the 6 o’clock news in Baltimore, because the whole goal in the media at the time I was coming up was you try to move to larger markets. And Baltimore was a much larger market than Nashville. So, getting the 6 o’clock news co-anchor job at 22 was such a big deal. It felt like the biggest deal in the world at the time. When I turned 40, I was so glad that didn’t happen. Hi, Suzie. Very friendly. You can’t be angry with Suzie. Remember Suzie. But my name wasn’t Suzie. And, you know, I’d grown up not really loving my name, because when you’re looking for your little name on the lunch boxes and the license plate tags, you’re never going to find Oprah. So, I grew up not loving the name, but once I was asked to change it, I thought, well, it is my name and do I look like a Suzie to you? So, I thought, no, it doesn’t feel right. I’m not going to change my name. And if people remember it or not, that’s OK.
And then they said they didn’t like the way I looked. This was in 1976, when your boss could call you in and say, “I don’t like the way you look.” Now that would be called a lawsuit, but back then they could just say, “I don’t like the way you look.” Which, in case some of you in the back, if you can’t tell, is nothing like Barbara Walters. So, they sent me to a salon where they gave me a perm, and after a few days all my hair fell out and I had to shave my head. And then they really didn’t like the way I looked. But even worse than being bald, I really hated, hated, hated being sent to report on other people’s tragedies as a part of my daily duty, knowing that I was just expected to observe, when everything in my instinct told me that I should be doing something, I should be lending a hand. So, as President Hennessy said, I’d cover a fire and then I’d go back and I’d try to give the victims blankets. And I wouldn’t be able to sleep at night because of all the things I was covering during the day. And, meanwhile, I was trying to sit gracefully like Barbara and make myself talk like Barbara. And I thought, well, I could make a pretty goofy Barbara. 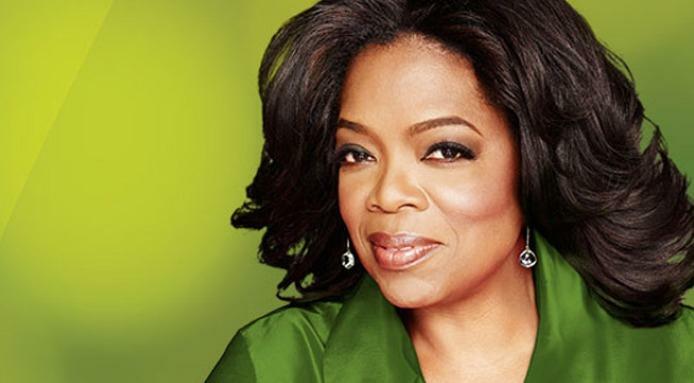 And if I could figure out how to be myself, I could be a pretty good Oprah. I was trying to sound elegant like Barbara. And sometimes I didn’t read my copy, because something inside me said, this should be spontaneous. So, I wanted to get the news as I was giving it to the people. So, sometimes, I wouldn’t read my copy and it would be, like, six people on a pileup on I-40. Oh, my goodness. And sometimes I wouldn’t read the copy—because I wanted to be spontaneous—and I’d come across a list of words I didn’t know and I’d mispronounce. And one day I was reading copy and I called Canada “ca nada.” And I decided, this Barbara thing’s not going too well. I should try being myself. So, I was juggling these messages of expectation and obligation and feeling really miserable with myself. I’d go home at night and fill up my journals, ’cause I’ve kept a journal since I was 15—so I now have volumes of journals. So, I’d go home at night and fill up my journals about how miserable I was and frustrated. Then I’d eat my anxiety. That’s where I learned that habit. It’s true. And how do you know when you’re doing something right? How do you know that? It feels so. What I know now is that feelings are really your GPS system for life. When you’re supposed to do something or not supposed to do something, your emotional guidance system lets you know. The trick is to learn to check your ego at the door and start checking your gut instead. Every right decision I’ve made—every right decision I’ve ever made—has come from my gut. And every wrong decision I’ve ever made was a result of me not listening to the greater voice of myself. And when you do get still and let your internal motivation be the driver, not only will your personal life improve, but you will gain a competitive edge in the working world as well. Because, as Daniel Pink writes in his best-seller, A Whole New Mind, we’re entering a whole new age. And he calls it the Conceptual Age, where traits that set people apart today are going to come from our hearts—right brain—as well as our heads. It’s no longer just the logical, linear, rules-based thinking that matters, he says. It’s also empathy and joyfulness and purpose, inner traits that have transcendent worth. So, how do I define success? Let me tell you, money’s pretty nice. I’m not going to stand up here and tell you that it’s not about money, ’cause money is very nice. I like money. It’s good for buying things. But having a lot of money does not automatically make you a successful person. What you want is money and meaning. You want your work to be meaningful. Because meaning is what brings the real richness to your life. What you really want is to be surrounded by people you trust and treasure and by people who cherish you. That’s when you’re really rich. So, lesson one, follow your feelings. If it feels right, move forward. If it doesn’t feel right, don’t do it. And what I’ve found is that difficulties come when you don’t pay attention to life’s whisper, because life always whispers to you first. And if you ignore the whisper, sooner or later you’ll get a scream. Whatever you resist persists. But, if you ask the right question—not why is this happening, but what is this here to teach me?—it puts you in the place and space to get the lesson you need. My friend Eckhart Tolle, who’s written this wonderful book called A New Earth that’s all about letting the awareness of who you are stimulate everything that you do, he puts it like this: He says, don’t react against a bad situation; merge with that situation instead. And the solution will arise from the challenge. Because surrendering yourself doesn’t mean giving up; it means acting with responsibility. Many of you know that, as President Hennessy said, I started this school in Africa. And I founded the school, where I’m trying to give South African girls a shot at a future like yours—Stanford. And I spent five years making sure that school would be as beautiful as the students. I wanted every girl to feel her worth reflected in her surroundings. So, I checked every blueprint, I picked every pillow. I was looking at the grout in between the bricks. I knew every thread count of the sheets. I chose every girl from the villages, from nine provinces. And yet, last fall, I was faced with a crisis I had never anticipated. I was told that one of the dorm matrons was suspected of sexual abuse. That was, as you can imagine, devastating news. First, I cried—actually, I sobbed—for about half an hour. And then I said, let’s get to it; that’s all you get, a half an hour. You need to focus on the now, what you need to do now. So, I contacted a child trauma specialist. I put together a team of investigators. I made sure the girls had counseling and support. And Gayle and I got on a plane and flew to South Africa. And the whole time I kept asking that question: What is this here to teach me? And, as difficult as that experience has been, I got a lot of lessons. I understand now the mistakes I made, because I had been paying attention to all of the wrong things. I’d built that school from the outside in, when what really mattered was the inside out. So, it’s a lesson that applies to all of our lives as a whole. What matters most is what’s inside. What matters most is the sense of integrity, of quality and beauty. I got that lesson. And what I know is that the girls came away with something, too. They have emerged from this more resilient and knowing that their voices have power. Not a small topic this is, finding happiness. But in some ways I think it’s the simplest of all. Gwendolyn Brooks wrote a poem for her children. It’s called “Speech to the Young : Speech to the Progress-Toward.” And she says at the end, “Live not for battles won. / Live not for the-end-of-the-song. / Live in the along.” She’s saying, like Eckhart Tolle, that you have to live for the present. You have to be in the moment. Whatever has happened to you in your past has no power over this present moment, because life is now. But I think she’s also saying, be a part of something. Don’t live for yourself alone. This is what I know for sure: In order to be truly happy, you must live along with and you have to stand for something larger than yourself. Because life is a reciprocal exchange. To move forward you have to give back. And to me, that is the greatest lesson of life. To be happy, you have to give something back. I know you know that, because that’s a lesson that’s woven into the very fabric of this university. It’s a lesson that Jane and Leland Stanford got and one they’ve bequeathed to you. Because all of you know the story of how this great school came to be, how the Stanfords lost their only child to typhoid at the age of 15. They had every right and they had every reason to turn their backs against the world at that time, but instead, they channeled their grief and their pain into an act of grace. Within a year of their son’s death, they had made the founding grant for this great school, pledging to do for other people’s children what they were not able to do for their own boy. The lesson here is clear, and that is, if you’re hurting, you need to help somebody ease their hurt. If you’re in pain, help somebody else’s pain. And when you’re in a mess, you get yourself out of the mess helping somebody out of theirs. And in the process, you get to become a member of what I call the greatest fellowship of all, the sorority of compassion and the fraternity of service. The Stanfords had suffered the worst thing any mom and dad can ever endure, yet they understood that helping others is the way we help ourselves. And this wisdom is increasingly supported by scientific and sociological research. It’s no longer just woo-woo soft-skills talk. There’s actually a helper’s high, a spiritual surge you gain from serving others. So, if you want to feel good, you have to go out and do some good. I was always happy doing my talk show, but that happiness reached a depth of fulfillment, of joy, that I really can’t describe to you or measure when I stopped just being on TV and looking at TV as a job and decided to use television, to use it and not have it use me, to use it as a platform to serve my viewers. That alone changed the trajectory of my success. So, I know this—that whether you’re an actor, you offer your talent in the way that most inspires art. If you’re an anatomist, you look at your gift as knowledge and service to healing. Whether you’ve been called, as so many of you here today getting doctorates and other degrees, to the professions of business, law, engineering, humanities, science, medicine, if you choose to offer your skills and talent in service, when you choose the paradigm of service, looking at life through that paradigm, it turns everything you do from a job into a gift. And I know you haven’t spent all this time at Stanford just to go out and get a job. You’ve been enriched in countless ways. There’s no better way to make your mark on the world and to share that abundance with others. My constant prayer for myself is to be used in service for the greater good. So, let me end with one of my favorite quotes from Martin Luther King. Dr. King said, “Not everybody can be famous.” And I don’t know, but everybody today seems to want to be famous. That’s the fame trip, so I don’t know if you want that. In a few moments, you’ll all be officially Stanford’s ’08. You have the heart and the smarts to go with it. And it’s up to you to decide, really, where will you now use those gifts? You’ve got the diploma, so go out and get the lessons, ’cause I know great things are sure to come. You know, I’ve always believed that everything is better when you share it, so before I go, I wanted to share a graduation gift with you. Underneath your seats you’ll find two of my favorite books. Eckhart Tolle’s A New Earth is my current book club selection. Our New Earth webcast has been downloaded 30 million times with that book. And Daniel Pink’s A Whole New Mind: Why Right-Brainers Will Rule the Future has reassured me I’m in the right direction. I really wanted to give you cars but I just couldn’t pull that off! Congratulations, ’08!